Tempus fugit! Aubrey Dennis Jenkins, emeritus professor of polymer chemistry at the University of Sussex, UK, a distinguished, respected, and long-serving member of IUPAC, celebrated his 80th birthday in September 2007. He spent many years serving the scientific community through his work in industry (with Courtaulds Ltd. and Gillette Industries Ltd.) and academia at the University of Sussex and as a visiting professor in the Czech Republic, Switzerland, and USA. He served as dean of the School of Molecular Science at the University of Sussex for five years. He also served the community as a board member for the Brighton District Health Authority, Haywards Heath College, and the West Sussex Institute of Higher Education. Jenkins had many mentors during his career, including T.B. Price, M.F. Gardener, R.E. Norris, Silvanus P. Thompson, Alexander Findlay, A.J. Allmand, Sir Christopher Ingold, Sir Harry Melville, C.H. Bamford, Colin Eaborn, O. Wichterle, R. Cahn, Paul Flory, and Sir John Cornforth. In turn, many of his former students later became distinguished scientists in academia or industry, including Richard Wane, Roy Lehrle, Francis Andrew, “Gaf” Roberts, and Ernesto Engel. Jenkins’ scientific pursuits focused largely on the kinetics of radical polymerisation. He was the first scientist to propose “buried” or “trapped” radicals, and he made significant contributions to the understanding of retardation and inhibition of polymerization. More recently, his work on the prediction of radical and monomer reactivity led to an alternative to the Q-e-scheme of Alfred and Price. Known as the “patterns scheme,” he continued to work on the underlying concepts after his retirement in 1992, work that has resulted in 10 more publications. He has published more than 130 research papers, was tapped as an expert in lawsuits, and lectured at conferences throughout his career. He continues to engage in research and publish. 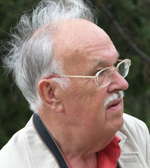 Jenkins also was a fellow of the Royal Society of Chemistry, a fellow of the former Royal Institute of Chemistry, a member of the Society of Chemical Industry, and has been a member of IUPAC since 1976. He served as chairman of the Committee on Macromolecular Nomenclature from 1977 to 1985 and was for eight years secretary of the Macromolecular Division. He was a member of the UNESCO European Expert Committee on Polymer Science, Industry, and Environment; the British Library Scientific Committee; the British National Committee for Chemistry; and the British Committee for IUPAC. He served as secretary of the UK High Polymer Research Group from 1991–2002. He has also served on the editorial boards of the European Polymer Journal, the Journal of Macromolecular Science, Resource Recovery and Conservation, Die Makromolekulare Chemie, and continues to be a highly valued member of the editorial board of Polymer International. He has been awarded the Heyrovsky Gold Medal for Chemistry of the Czech Academy of Sciences and is an honorary member of the Argentine Society for Organic Chemistry. His personal hobbies include classical music, photography, and travel. Jenkins is married to Jitka Jenkins, who is also a polymer chemist.